Colourful birds of all shapes and sizes were not the only breathtaking scene during this time of the year at the Kumana National Park. Thousands of devotees throng Kataragama for the season. Pada Yathra, the foot pilgrimage seeking the blessings of God Skanda is one of the oldest religions traditions. For centuries thousands of pilgrims following the traditions of their predecessors make the 'pada yathra' to Kataragama or Katirgamam every year. 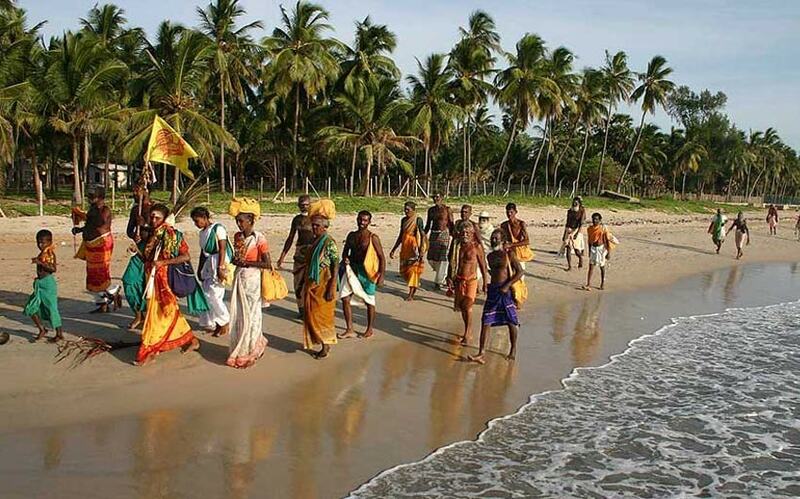 The 'Pada Yathra' or the foot pilgrimage is believed to have originated from Jaffna following the poojas at Selva Sannithy Kovil for God Skanda located on the sand banks of Thondamannar Aru. Today, the Thondamannar barrage is built next to the temple. Traditionally the pilgrims spend around two months for their journey starting from Jaffna. Later with the increase of LTTE hostilities in the North the devotees started this pilgrimage from Kannaki Amman Kovil in Vattapallai - on the banks of the Nanthi Kadal lagoon in Mullaitivu. Passing Kannkerny, Kumulamunai, Chemmalai, Kokkuttuduwai, Karnattukerni, Kokilai, Pulmudai, Tiriyaya, Kuchweli, Kumburupitti, Gopalapuram, Nilaweli, Okanda, Weheragama, Bangura and Madamethota pilgrims then cross Kumbukkan Oya and finally entre the Yala National Park. Entering Yala, the pilgrims rest at Poththana, then reach Katagamuwa and cross the Menik Ganga (river) at Warahana and arrive at Kataragama. Some start their pilgrimage from Vilundri Kandaswami Kovil in Trincomalee. The Guardian of the Weheragama Śrī Murugan Kovil, Naidihami Varunaranga (51) was busy performing poojas for the devotees. Hailing from Panama, Naidihami is dedicated to closely follow the traditions of his ancestors. Two 'nades' (pilgrim groups) were behind the kovil having their breakfast. 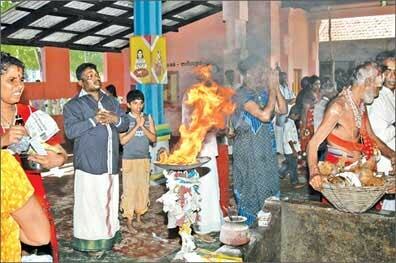 "Normally I open the Kovil on Fridays but because of the Pada Yathra I keep it opened daily," Naidahami said. He has only few minutes to rest. The next group of devotees wait for the religious rituals to be performed. Sivayogarajah, a bank manager was resting with his 'nade', after reaching Weheragama by bus. "The pilgrimage is organised by our pilgrims' society and this time we are offering food to the pilgrims. Our families will proceed further by bus but I will walk with the rest of the pilgrims," he said. Sivasambu, the chief of the other 'nade' at Weheragama, has started the pilgrimage from Akkaraipattu with 20 devotees. "We set out on July 9 from Akkaraipattu. I've been on this pilgrimage for eight years," said Sivasambu. For their 'nade' it took three days to reach Okanda from Akkraipattu. Normally, devotees avoid telling their destination for the day as they believe it will be a bad omen! The foot pilgrimage is to learn and enjoy the 'walk'. The golden rule is to accept whatever happens as they are assured of the blessings of God Skanda. Sharing whatever the meagre comforts available, the devotees to treat friendship, alms and wisdom as god given. Basnayake Nilame of the Okanda Kataragama Devale Punchi Mahattaya Muthubanda had served 25 years. The number of pilgrims has increased. "I belong the fifth generation and I'm extremely happy that there is a conducive environment for my sons to continue family traditions," Basnayake Nilame Muthubanda said. It is the responsibility of the Basnayake Nilame with the District Secretary (GA) and local government officials to provide facilities to pilgrims. Over 2,000 pilgrims were at Okanda Kataragama Devale. Water and sanitary facilities are vital needs at the devale. The Government has taken steps to provide facilities to devotees. Drinking water is provided at every resting place. Water is supplied regularly in bowsers. The Special Task Force (STF) provides water and ensures security to the camping area. Pushpawathi has put up a shop in the Okanda Devale premises. "We were doing this shop for nine years and this time number of devotees has increased," Pushpawathi said. Pushpawathi recalls the dreadful days of the terrorists. "Now it is over," she said with great relief. Pilgrims reach Bangura, a paradise for birds. A few hundred meters away lies the deep blue ocean and on the other side is the thick green shrub jungle. Madamethota that lies on the banks of Kumbukkan Oya, is the next resting place for pilgrims.At Madamethota a medical camp was set up by doctors from the Panama area. Garbage remains a major problem. "We tried to remove the garbage using tractors but it failed due to the large number of devotees," said Park Warden Ajith Wasantha. The Park Warden allowed Environment Society of Panampattuwa to clear the garbage. "We collect all the garbage from the camp" Ananda added. "We educate the pilgrims on protecting the environment during this season. We have to safeguard the devotees from animal attacks" said E.A.D. Chandrasiri a wild life officer. 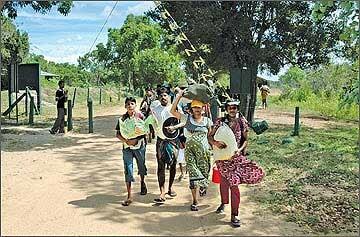 Following the emergence of peace the number of pilgrims to Kataragama is on the rise. According to the Wild Life officials around 30,000 devotees are expected for this year's foot pilgrimage. By July 12 over 2000 devotees joined the 'pada yathra' at Okanda. 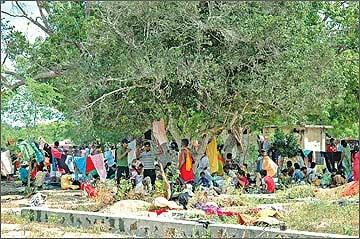 Within two weeks over 15, 400 devotees entered the Kumana National Park.